Census bureau trends project that by 2040 minorities will be the new majority holding 42% of the U.S. population. In 2010 the U.S. Census Bureau reported 34% of the current population are minorities with 13.5% being African-American and 15.4% Latino. The problems of the 21st century, such as sustainability, healthcare and education, etc. are wicked problems and will require collaboration between people having diverse backgrounds and viewpoints. The diversification in design is long overdue and greatly lags behind the progress of other industries. 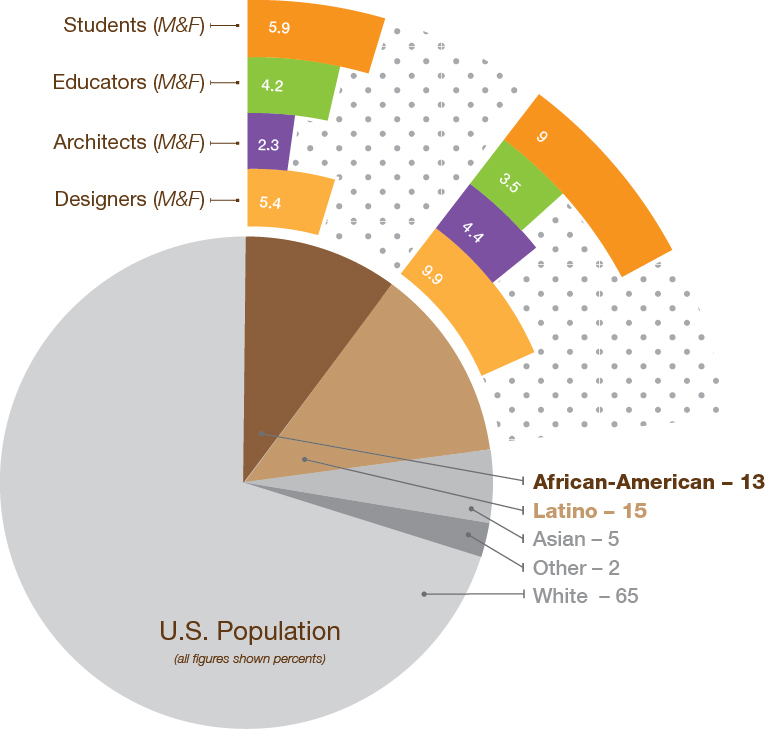 Although there is not much data on race and ethnicity within each of the design disciplines, in 2013 the National Architectural Accrediting Board reported the overall enrollment in accredited programs (123 institutions total) by ethnicity is 5% African-American and 16% Latino. The 2012 data summary from the Higher Education Arts Data Service collected reports from 283 schools nationwide with art and design programs. They found of 7,409 faculty members, African-American men represent 2.7% (203 total) and African-American women represent 1.5% (108 total) of the total faculty. And Latino men represent 2.1% (157 total) and Latino women represent 1.4% (102 total) of the total faculty. The student body only has 2.6% males and 3.3% female African-American students. And 3.5% males and 5.5% female Latino students. In 2013, the U.S. Department of Labor, Bureau of Labor Statistics reports 11.2% and 15.6% of the workforce are African-American and Latino. They found that of 784,000 designers, the percent of total employed African-American designers is 5.4% (43,120 total) and 9.9% (77,616 total) are Latino. Although there is not much data on race and ethnicity within each of the design disciplines, this data was collected from the Census Bureau (2010 data), the National Architectural Accrediting Board, the Higher Education Arts Data Service and the U.S. Department of Labor.